One of the main ways in which Princes Risborough Baptist Church serves the community is by hiring out rooms to local organisations and groups. and the Lower Hall which is just beyond the welcome arch off Bell Street. We also have a small lounge which is able to seat 15 people comfortably. Following our, significant refurbishments we are now able to offer the church worship area itself for hire for suitable events. 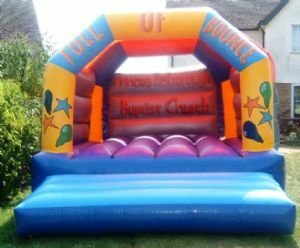 The Church has its own full-sized Bouncy Castle. This may be hired for children's parties, together with the full use of the Lower Hall and kitchen for a cost of £70 (excluding Insurance Cover for the use of the Bouncy Castle). The Lower Hall and kitchen may be hired for parties, without the Bouncy Castle for £35. Enquiries for bookings should go the Church Office, it's usually open Mondays, Wednesdays and Fridays between 10am and 12 noon. Tel: 01844 274499 or email prbaptist@btconnect.com.